CostWay Commercial Ice Maker is a fully automatic, portable and freestanding unit that is made of all stainless steel and with a 58-pound ice making capacity per 24 hours. It is easy on the eyes with a sleek and modern, simple yet elegant design with a flat door and a stainless steel front panel. The different processes of ice production are carried out automatically in this brand new upgraded ice cube maker: From water inlet, water filling and releasing to ice making and dropping. So it is capable of making ice non-stop without you needing to do anything manually. There are also warning indicators on the control panel for when there is not enough water or when the 8-pound capacity ice bin is full. And the ice maker will stop itself automatically. 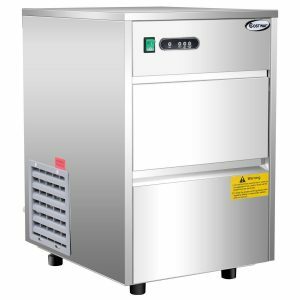 CostWay Ice Maker can be used in a variety of commercial settings including bistros, cafes, restaurants, grocery stores or homes. It has an efficient and powerful yet economical R134A compressor with 170W power (115V, 60Hz) and great heat dissipation that helps make ice quickly without consuming much power. This means, as a user-friendly unit, it will save you a lot of trouble over time especially if you use it frequently. It has the built-in security features like the electric shock protection class 1. With an antibacterial liner, it conforms to the standards of health and hygiene by stopping harmful bacteria from breeding. It is very robust and durable to withstand the frequent use over many years. Because the exterior panel is made of very good quality stainless steel and inside there is the sturdy, odorless and colorless food-grade ABS plastic as well as decent quality components overall that are not bad for your health. It is a trouble-free unit that is very easy to assemble in just ten minutes and operate via the practical and functional control panel. Costway Ice Maker weighs 58 pounds and measures 18.5 x 15 x 23.5 inches. It is a nice modern looking, convenient, functional, powerful, quick and economical ice maker that makes uniformly sized big bullet shaped ice cubes with a 58 lb. capacity per day. 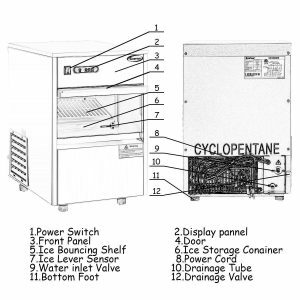 It makes 16 pieces of ice every twenty minutes, at each cycle. In the package, you will get the main ice maker unit, a water line, a drain line, an ice scoop, and the instructions manual. Please note that the ice will be kept frozen in the bin and you need to unload and put it in the freezer if you wish to make more ice in the next cycle. A couple of customers commented on the loud operation but the noise level is specified as 55 decibels, which is not too bad for an ice maker. The operating temperature is between 50 and 109 degrees Fahrenheit. It has a 68.5-inch cord, the water inlet pipe has a 0.75-inch diameter and the drain pipe diameter is 0.47 inches and you’ll need a spot for draining. It is shipped swiftly via Amazon.com within a few business days via UPS or USPS. There is good customer support available by the company and you’ll get assistance if you encounter any problems. Please call or email them if you receive any damaged parts and they will either replace the product or give you a discount. It is a good quality product that offers good value for money.